Saturday night on Bourbon Street – neon green and red and blue and colors of indeterminate hue, a gathering Louisiana mist, free (FREE!) entrance into the Lipstick Club. Old Absinthe House for a round, then off again down a tunnel of light and music and grime and the smell of cigarette smoke. So good. Regretfully, I could not hang. This band of Dad 2.0 Summit attendees, these brothers and sisters of the digital world, wandered inexorably through one more night together, inevitably toward the Cat’s Meow karaoke bar. When that realization dawned, when I knew that the clouded group-think had coalesced around the Cat’s Meow as its destination, I knew I didn’t have the energy. As much as I wanted one more chance to build memories with these beautiful friends, my hotel bed beckoned. I began to fall back. One friend after another drifted by, new faces and familiar, buddies and confidants, fellow writers and parents – I slowed my pace and let them slip past me through the Bourbon Street crowd. Until at last I was at the end of our line, swallowed on all sides by unfamiliar faces and revelers whose nights were just getting started. Then I stopped, watched the heads of friends old and new bob through the gathering French Quarter fog until the last of them was out of sight. I walked back to the hotel along quiet, glistening Royal Street. A lone street performer sang an unfamiliar blues piece in a darkened doorway. 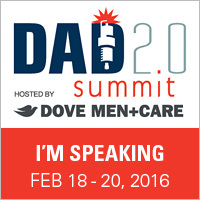 Another Dad 2.0 Summit was done. All that remained was to write the epitaph. Rob Candelino of Dove Men+Care. 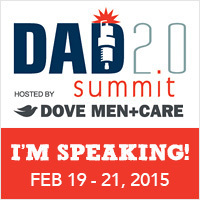 That was the question we were asked on Friday morning as the third annual Dad 2.0 Summit got underway at the J.W. Marriott New Orleans. The question, significantly, was asked of us by a brand representative. 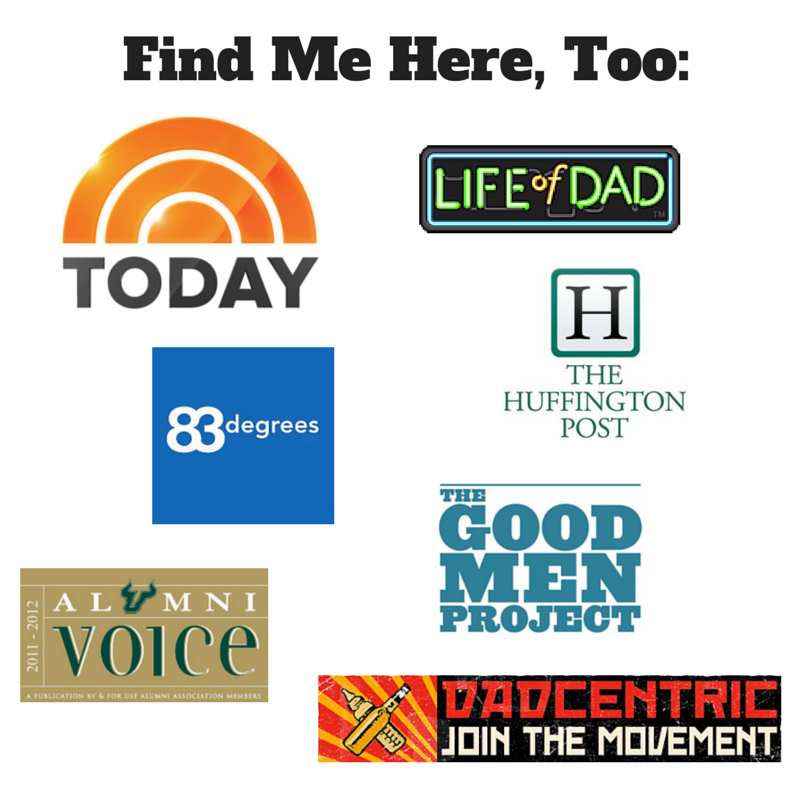 Actually, by THE brand representative as far as the dad blogger community ought to be concerned – Rob Candelino of Dove Men+Care. An informal study of 2013 commercials depicting fathers conducted by dad blogger Zach Rosenberg of 8BitDad revealed that, for the most part, things are moving in the right direction. Derogatory depictions of bumbling dads are not nearly as prevalent as they were. That’s progress. Procter and Gamble, the world’s biggest advertiser, touched hearts and likely moved product with the latest incarnation of Thank You, Mom ads associated with the upcoming winter Olympics. It seemed … odd … that they ignored the roles of the respective fathers of the athletes depicted, but an argument can be made that emphasizing the contributions of mothers does not necessarily de-emphasize those of the fathers. Of course, an argument also can be made that omitting dads from that advertising conversation was short-sighted on the part of P&G, but listen – at least they tried with the Dad’s Way and Modern Dad campaigns this past summer (disclosure: I was a blogger ambassador for both of those campaigns, which included a Father’s Day excursion at Brooker Creek Preserve). Pirate’s Alley, French Quarter, New Orleans. Perhaps what’s next, then, is for giant brands like P&G to follow the example of consistency demonstrated by Dove Men+Care and truly embrace what’s happening with this community of fathers who also happen to be talented, innovative content creators – and with engaged, enlightened fathers throughout the country. XY Media Group, parent company of Dad 2.0 Summit, is leading the way in that conversation and in the search for the answer to Candelino’s question. I, for one, can’t wait to see what happens next. What’s most exciting to me about it is that I have the opportunity to help shape that answer, as do all of the bloggers and brand representatives who made New Orleans home for the past four days. I was honored to be asked to conduct a round table workshop on journalism and storytelling. The participants lifted me mentally and – in one notable case – emotionally throughout the hour-plus session. Jim Higley made me mist up when he reminded me about an image I used in a post about our family’s trip to Tropicana Field to see the Rays and Red Sox in October. So, yes … during a weekend of emotional gut-punches, I even cried during my own workshop! If you were there – or if you were not – and would like to chat about the topic and techniques of purposeful observation as a means to breathe life into your writing, please don’t hesitate to contact me. Thank you to all of those who attended, and a huge thank you to those of you who have since given me a kind word about the workshop itself and about how it already has affected your approach to storytelling. Blogger Lorne Jaffe of Raising Sienna and the New York City Dads Group earned a standing ovation for the greatest show of courage I’ve witnessed in two years of attending Dad 2.0. His willingness to confront his own depression-anxiety disorder in that very, very public setting – and his brilliant turns of phrase and use of imagery in the post he read “Do I Really Like What I Like?” – gave me strength. It was likely the moment most people who were there will remember years from now when we talk about Dad 2.014. Hanging with my fellow DadCentric bloggers, Kevin McKeever, Michael Moebes and Whit Honea, as well as fellow 2013 Spotlight Bloggers McKeever, Honea and Chris Read was another highlight. As I say, I could not hang Saturday night, but part of the reason for that was I made the rookie (or sophomore) mistake of hitting the Quarter a bit too hard on the first night and never quite regained full equilibrium. I enjoyed every minute I spent with them, though, as well as all of the friends I met in Houston in 2013 – Jim Higley, Mike Adamick, Jay Sokol, Jeff Bogle, Creed Anthony, Charlie Capen, Andy Herald, Jim Lin, Amy Windsor, Sam Black, John Pacini, Lance Somerfeld, Matt Schneider, Chris Lewis, Oren Miller, Adrian Kulp, Jason Greene, Kenny Bodanis, the guys from the National at Home Dads Network, the guys from Life of Dad, the guys from the National Fatherhood Initiative, and on and on. Then there were the first-timers, people I had met online only, who now I can include in my personal, ever-growing web of true, “in-real-life” friends who share an interest in parenthood and the creative impulse – Jess Sanfilippo, Lizz Porter, John Kinnear, John Willey, Brent Almond, Eric of Dad on the Run, Justin Aclin, Buzz Bishop, Vincent Daly, Scott Flax and so many, many more. Listening to Jim Higley and Parenthood creator and show runner Jason Katims talk about parenting, the creative process and other important topics on Friday was a privilege. I was fortunate enough to run into Jason during that night’s cocktail party and he was kind enough to answer two questions: Is the message about authentic portrayals of fathers in media resonating in his industry (short answer: slowly, but surely) and what were his favorite TV shows as a kid (he mentioned All in the Family and Taxi as influencers, along with several other half-hour sitcoms that I didn’t quite catch). I also appreciated hearing Josh Levs share his parenting journey and announce the publication of his new book in front of the Dad 2.0 audience. And it was interesting to see closing keynoter Peter Shankman displaying his pair of Google Glass (Google glasses?) all day Saturday at the J.W. Marriott. The future is here. The folks from Dove Men+Care were amazing, as usual, and I would be remiss if I failed to thank them for the Movie Night on the Couch prize pack that I won and the framed photos from the Real Dad Moments campaign. We appreciate all the other brand representatives who did so much to make the experience great: Cottonelle (for whom I blogged — thanks to XY Media — during the Let’s Talk Bums campaign in the fall); National Geographic Animal Jam (hence, the skunk in the photo above); Jamba Juice; Kraft Cheese; Lee Jeans; LEGO Friends; Microsoft Surface; the New Orleans Convention and Visitors Bureau; Little Remedies; and the savior, Starbucks Via. I’ll never forget Whit Honea’s remarkable reading of Two Busy’s Spotlight post, By Such Swift Currents. It was a fitting swan song for DadCentric, as well as a wonderful way to honor the work of one of the finest writers in our community. Fog shrouds Royal Street on Sunday morning. I’ll wrap it up with a special thank you to two of my all-time favorites in this community, my New Orleans roommates David Vienna of The Daddy Complex and Aaron Gouveia of the Daddy Files. The weekend flew by far too quickly, my friends. I appreciate everything you did to make it memorable for me. So, what now? For the community, for society, it seems clear XY Media Group and other prominent dad groups will continue to consolidate and build on the efforts that seem to have made headway over the past three or four years. But what about for me, personally? What now for this journal? That’s simple – I’ll just keep telling stories as well as I can, and try to make this online journal/whatever it has become something worth the time of its readers. I will also answer the call, when it comes, to help tell stories that depict fathers and fatherhood in an authentic light. It’s the least I can do for a community that has given so much to me in such a short amount of time.